The Klondike Highway! Don’t stand in the middle of the road to take a photo, please. Skagway is one of the three Southeast Alaska towns connected to the rest of the continent by road. That’s pretty neat. Best of all, when you come to Skagway, you can take a tour of this road and see some pretty amazing sights. It’s called the Klondike Highway and today, I am going to take you on a virtual tour of this amazing roadway because I am very nice. How scenic is it? It’s so scenic that it was named one of the top 10 most scenic highways in the world! By me. I named it as such because I’ve driven on a lot of roads and it is definitely one of the most scenic. Congratulations, Klondike Highway! Our virtual tour of the Klondike Highway begins! The Klondike Highway starts in Skagway, right in the spot where the cruise ships dock. Just a few miles north, the road begins to ascend toward the White Pass Summit, which is 15 miles away from the start. Along the way, there are some amazing waterfalls, incredible views, and multiple places to pull off the road and take a photo. At the Summit is the Welcome to Alaska sign, which is a popular photo spot. Be on the lookout for hoary marmots, mountain goat, wolverine, bears, and Bigfoots. When you cross the border, the scenery opens up into a vast panorama. It’s really something. A few miles away is Canadian Customs, where they check your passport for entry into their fine country. They don’t dress like Mounties, which is a little disappointing. 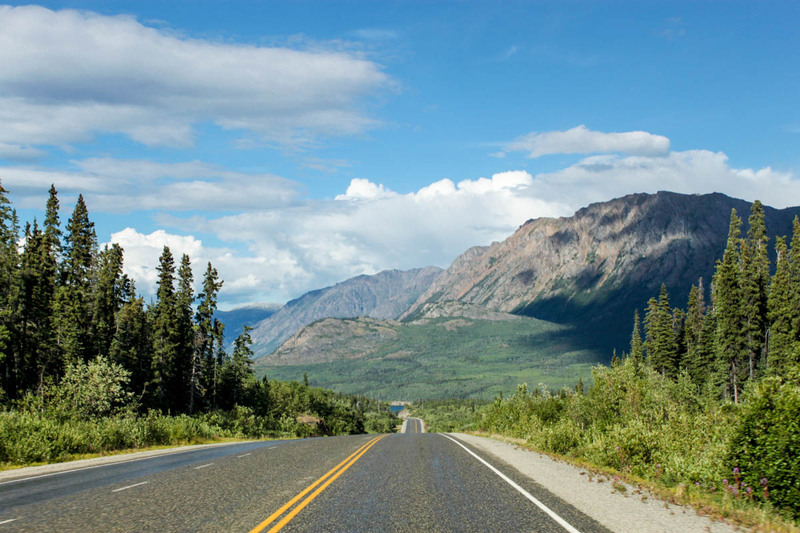 This stretch of the Klondike Highway is about 25 miles long and features more amazing scenery and a chance to see just about every variety of northern wildlife imaginable. Around Lake Tutshi, I frequently see lynx roaming about. If you don’t see one, perhaps it’s the missing lynx. Before you know it, you are in the Yukon. There is a big sign that welcomes you there because everyone loves signs. On the mountain peak above the sign, goats and sheep are frequently spotted. They are not barnyard animals, these are wild mountain goats and Dahl sheep. I doubt they know the difference but you will. The lake to your right is Tagish Lake. I catch a lot of big trout in that lake. The biggest I caught was 30 pounds. I practice fillet-and-release and I can tell you for a fact that it tasted great. You pass some other stuff and it’s all very pretty. This is a good place to see bears. I saw a 1,000-plus pound grizzly bear here one time. It was scary. After a while, you come to Carcross, which is a small town. Then you pass the world’s smallest desert before coming to Emerald Lake, which is a pretty body of water that people like to photograph. You can keep going from here, but I would just come back to Skagway because that’s enough virtual tour for one day. I hope you enjoyed this virtual tour of the Klondike Highway, which I just nominated as one of the top 3 most scenic highways in the world. Stay tuned because next week, it might just be Number One!